Hey guys, I joined up here to start learning about what to do with my container plants during the winter. I have 2 Bhut Jolokia's (Ghost Chili) in 12 or 14" pots and I have a wide wooden herb 'pot' as well that I have rosemary and basil in. My peppers are in production right now, but I just wanted to be prepared when winter came. I don't quite understand what will happen to my plants when I move the containers in during winter. My plan is to take them outside every summer and keep them inside every winter, producing peppers in summer, but not in winter. I really wanted to get some pointers on where to look for information on keeping the plants inside for the winter (how to prune for winter, will they live during winter, fertilize during winter?, etc). Thanks for starting me out! To start with get familiar with the Search the Forum feature, you will find lots already written here on your topics. lancerguy wrote: Hey guys, I joined up here to start learning about what to do with my container plants during the winter. I have 2 Bhut Jolokia's (Ghost Chili) in 12 or 14" pots and I have a wide wooden herb 'pot' as well that I have rosemary and basil in. My peppers are in production right now, but I just wanted to be prepared when winter came. I place my potted rosemary next to a sunny window in my unheated/attached garage for the winter. It makes it every year. Temps never get below 40 degrees in there, and I water whenever I remember, LOL. Since it's cool, there are no bug problems. I suspect that they can't handle indoor dry heat well. And that they appreciate a dormant period. So no fertilizing, and a light touch with the water. In the spring it'll start growing on its own and you can place it outdoors after nightime temps stay in the high 40s for awhile. If ya want to be really nice to it, repot it then too~ I'm on my 4th year with my rosemary, doing it that way. As to keeping basil alive, it can be done under lights, (on for 12 hours a day, if I recall correctly) but the results are seldom satisfactory. They get weird. Woody. Leggy. Probably because it's a true annual, and not a perennial shrub like the rosemary. And they do need alotta light. I overwinter an African Blue Basil every winter- but only to take cuttings in the spring and to start new plants from those. You could try doing the same with your basil; they root very easily in damp soil, with no need for hormone powder. 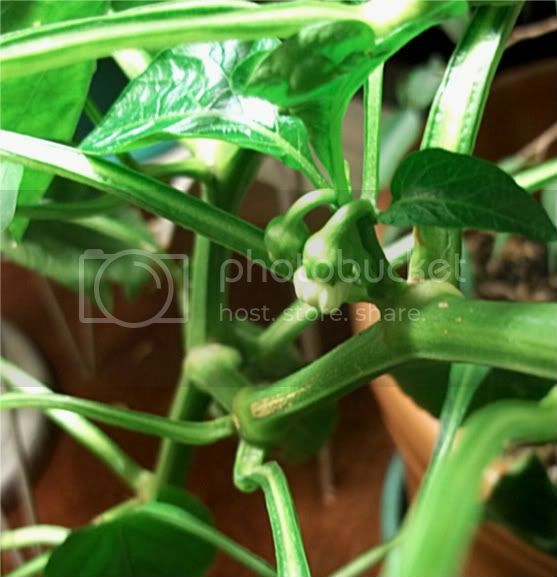 Didn't know exactly where to put this, but my bell pepper plant that I brought indoors for the winter has put out two new little blossoms! Now that it is doing so nicely, it just got demoted! It was in the corner with windows on one side, big floor to ceiling picture window on the other side and the gooseneck lamp in the corner. But the picture window is where the Christmas tree goes, so all the plants/trees that were in front of it got moved to other places, in front of just regular windows.... I hope the basil and pepper make it that way until January when they can get their spot back! 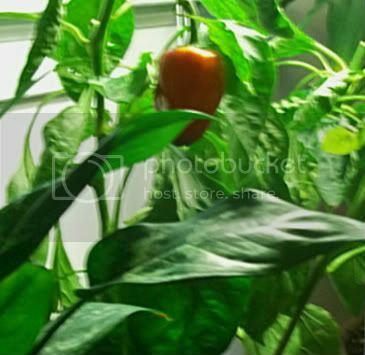 New update -- the peppers that were left on it when I brought it in (I took most of them off, but left three little ones) are turning red/ ripening up! They never got very big, not much more than half the size they would have been if they had been able to keep growing outside, but they are ripening! Congrats about the bell peppers! I still want to try to grow sweet peppers inside. I have Cubanelle hot peppers in a window in the den and they are making a lot of peppers and some of them are big enough to eat now. maybe almost 2 inches long! I have some other kinds of hot peppers in the den too but they don't have any peppers on them yet. Just based on my last year's experience (which I posted elsewhere) hot peppers seems to be easier than bell peppers. They don't seem to be as fussy about moisture levels and don't mind being root-confined as much. If you have the space for a large pot to put them in and sufficient supplemental light, and you give them steady moisture, I think bell peppers might do quite well. I had a HUGE aphid problem though, so watch out for that. I picked and ate the three peppers that ripened up. The plant is not doing great - the leaves that were on it when it came in are droopy and getting a bit shrivelled, despite daily misting. The two new blossoms it put out dropped off without setting fruit. But it continues to put out tiny new leaves, so it is still alive. All I am trying for is to keep it alive for another three months until it can go back outside. Trust me. You can prune off any branches that are not doing well. Mine grew exponentially after the daylight started to lengthen. Suggest concentrating on giving them good light so the new growths will have chance to grow sturdy. Yup. I was figuring if it continues to shrivel, I might cut it back more. I didn't cut it back all that much when I brought it in. Giving it as much light as I can, but I know that isn't nearly as much as it would like. The pepper initially put out a few flowers, but never set any new fruit indoors. It looks pretty droopy these days, but is continuing to put out new leaves and recently with increasing hours of daylight, seems to be growing more, including putting out a new branch from down near the bottom. So although it looks a little droopy, I believe it is quite healthy and I am looking forward to putting it out in a few weeks and seeing what it does in its second year. The basil on the other hand looks terrible, only a little of it left at the top of long woody bare stems and the leaves are getting shrively and spotty. Not growing very much. I think it is dying, it is just a question of how fast it dies, whether it lasts long enough to take it back out. Ordinarily if I had a plant looking this bad, I would pitch it (it's somewhat of an embarrassment in my living room! ), but I want to continue the experiment as long as I can. I have noticed though, that while the plant suffers, the remaining leaves are very pungent of basil essence. It would ordinarily be at least 6 weeks until I could put them out, but with the way this winter/ spring is going, perhaps only three or four. (I could actually put them out tomorrow, it is supposed to go up to 65, but then I would be committing to bringing them in and out and they are in big heavy pots.) Hang in there, guys! Any advice on keeping a bougainvillea plant alive indoors? 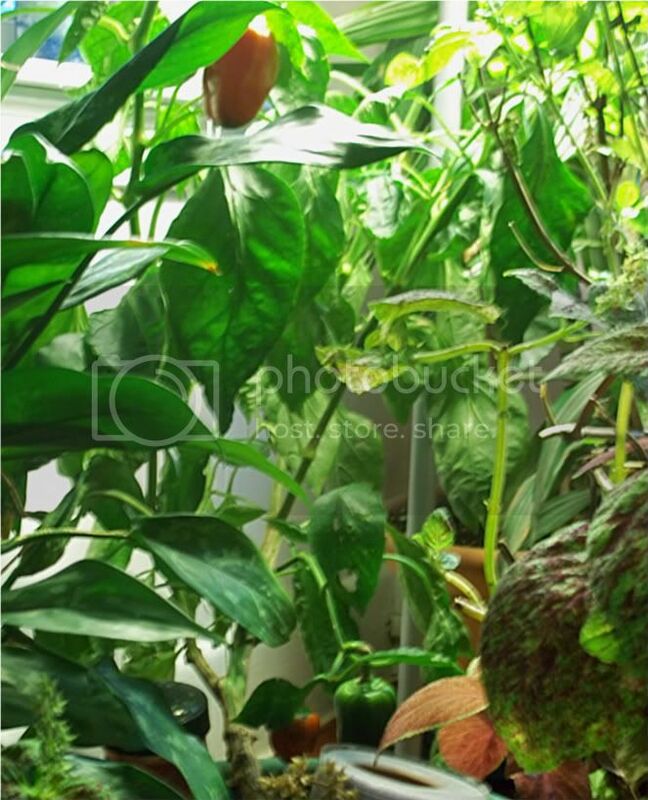 What vegies grow indoors during the winter?